International human rights activist Lisa Shannon spent many afternoons at the kitchen table having tea with her friend Francisca Thelin, who often spoke of her childhood in Congo—a peaceful Congo, a place so different than the conflict-ravaged places Shannon knew from her activism work. Then the nightly phone calls from Congo began: static-filled, hasty reports from Francisca’s mother, “Mama Koko,” of gunmen—Joseph Kony’s Lord’s Resistance Army—launching attacks. Night after night for a year, Mama Koko delivered the devastating news of cousins, nieces, nephews, friends, and neighbors, who had been killed, abducted, burned alive on Christmas Day. In an unlikely journey, Shannon and Thelin decided to travel from Portland to Dungu, to witness first-hand the devastation unfolding at Joseph Kony’s hands. Join us for this moving discussion as Shannon reflects on her friendship with Francisca and Mama Koko, her experience in the Congo, and how she confronted her limitations as an activist and reconciled her vision of what it means to effect meaningful change in the lives of others. Lisa J. Shannon is a human rights activist, writer and speaker. In 2005, she founded Run for Congo Women, the first national grassroots campaign in the US working to raise awareness of the humanitarian crisis in Congo. Since then, she has spearheaded multiple major media and human rights campaigns for Congo and Somalia. She was a 2012-2013 Gleitsman Fellow with Harvard’s Center for Public Leadership and is a 2013-2014 fellow with Harvard Kennedy School’s Carr Center for Human Rights. Shannon holds a Masters in Public Administration from the Harvard Kennedy School and an Honorary Doctorate from Georgetown University. She is the author of the award-winning A Thousand Sisters and she has been featured on countless media outlets including “The Oprah Winfrey Show,” National Public Radio’s “Morning Edition,” The New York Times, The New York Times Magazine, The Economist, and more. In 2010 she was named one of O Magazine’s 100 Most Influential Women on the Planet. She lives in Portland, Oregon. Copresented by the World Affairs Council of Oregon and Portland Art Museum in conjunction with the U.S. premiere of Richard Mosse’s powerful video installation The Enclave. Museum members and World Affairs Council members free; non-members $5. Purchase advance tickets now. 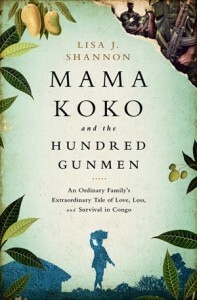 Read more about Mama Koko and the Hundred Gunmen: An Ordinary Family’s Extraordinary Tale of Love, Loss, and Survival in Congo.